Valerie asked about grist and sett for the yarns I’ve been using for my shadow weave samples. I had to stop and go look for this information, in fact I even used my McMorrin yarn balance for the first time. Firstly, I realized that grist doesn’t really mean anything to me. I know the definition, but that is only intellectual knowledge. Experientially, I don’t know what to do with that information. As a handspinner I am most familiar with WPI (wraps per inch), so this is what I apply to both knitting and weaving as well. Gauge and grist? Well, I have to stop and think about them. I have to reason through what they mean to me and the project I want to work on. WPI? I can run with that. Secondly, I realized that even though I am trying to keep better records with my shadow weave samples, there are still informational gaps in what I record on my worksheets. I am writing more things down and doing a better job of recording all the information in the same place, but , I have been realizing that I rely on my memory way too much. For some reason when I look at a weaving sample, or a handspun skein, or knitting pattern, I assume that I’ll remember more than I actually do. Consequently I have a dozen or so oddball sample skeins from fleeces whose breed and origin I don’t remember. I have several cones of weaving yarns with the labels misplaced. And I have several pairs of socks with mates which don’t fit the same because I couldn’t remember the exact modifications I made, or number of stitches I picked up. (Or, more likely, I misplaced the scrap of paper I jotted the information down on.) And to all this I’m now adding weaving samples with odd bits of information missing. I’m not consistently scatter brained. I do have a nice file box of spinning cards with control yarns and notes on them, and I have learned to keep a sock knitting notebook with a page for each person I knit socks for. And most of the time I manage to jot down all measurements, calculations, and changes. Weaving is a little easier because I have to write everything down in order to calculate yarn amounts for warp and weft measurements. And recently I purchased a 3-ring binder for my weaving notes and samples. So I am making progress, though at times I don’t feel like it. Sett, I'm not sure. I thought I used 10 epi for the red and white samples, but I wasn't happy with it. So for the orange and fair isle sock yarn sample, I used a sett of 12 epi and it made a much denser fabric. I liked it better, but it is hard to believe that only 2 ends per inch could make such a difference in the fabric. So I'm wondering if the specific shadow weave drafts make a difference. Does anybody have any experience with this? After all that I realized that the only way I will ever be able to use grist intuitively, is to pay attention to it and faithfully keep a record of it for the yarns I use. It may seem like more work right now, but I have faith that it will eventually pay off. 2 ends per inch, when you are talking about an initial sett of 10, is a great deal--if my arithmetic is correct, that is a 20% difference. Contrast with adding 2 ends to a sett of 40, much less difference. Thank you for the tag, I enjoyed doing it. Unfortunatley I deleted your comment as blog had played up and published a first draft, you've missed the last part of the posting. glad you like the medicinal dark chocolate, I swear by it. Oh My!!!! on the tutorial I am always amazed at peoples organizational skills something I lack in a big way. I recenty bought a wpi stick it is dutifuly hanging on my spinning wheel. I have woven! and all that I have woven has been my handspun silk. It just seems so hard with all the kids. Knitting is hard enough Thanks for visiting the new blog home. I am enjoying your Blog. 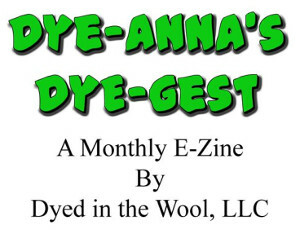 Our fiber arts guild blog is just getting started. We have felted purse instructions in our blog. Let us know if you try the pattern and how it turns out.